How would like you to Conquer the Fear of Flying? The fear of flying is one of the more common fears and phobias, that affect many of the population to varying degrees. Some are able to fly but don’t really enjoy it and for others the fear is so debilitating they’re unable to fly at all. Are you an anxious flyer? fly but find it difficult to relax? feel anxious, nervous or scared just by the idea of flying? Even though it’s known that flying is one of the safest ways to travel, the fear of flying effects many people in different ways, do any of these apply to you? You’re scared of being in the plane. You Fear of not being in control. You suffer with Claustrophobia – and fear not being able to get out. You are Anxious about turbulence. You have the Fear of Crashing. You Worry about loved ones. If any of these apply to you, you probably have some level of fear towards flying. The good news is it doesn’t have to be this way, fears and phobias are learnt irrational behaviours, which you can unlearn if you chose. You can re-programme your minds software, your thoughts, you feelings, beliefs, attitudes and behaviours, so you can enjoy a more empowering mindset so you can enjoy flying more comfortably with freedom and ease. Yes, then let me introduce you to my audio programme Overcome the Fear of Flying – Conquer the Fear of Flying. 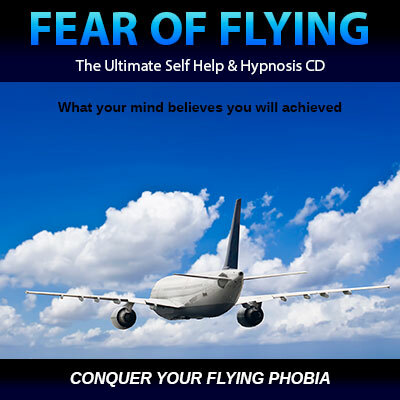 This Calm and Comfortable Flying Self Hypnosis Audio Programme is designed to help you re-programme your mind to increase your confidence to fly calm and comfortably, allowing you to fly feeling safe and at ease. Within the next few minutes you can be listening to The Overcome the Fear of Flying audio program from the comfort of your home, computer or smart phone and re-programme your mind for Calmer more comfortable flying. And getting the help you need to reduce the anxiety associated with flying.